When nurse Libardo Lozano hurried into the lobby of Jackson South Community Hospital in Miami on Wednesday, he saw something shocking: A woman was lying on the floor. Even though he was running late for his shift in the operating room, his instincts took over and he approached her to see what was wrong. “She said ‘I am having a baby,’ I said ‘Yes, of course,’” he told TODAY Moms. He examined the woman quickly. "The baby was already crowning," he said. “[I] go every single day to work and [I] don’t know what to expect that day,” he added with a laugh. Only moments earlier, Susana Privada and her husband, Carlos Saravia, walked into the hospital’s lobby. While Privada was two weeks away from her due date, she had felt pains as she was showering a half hour earlier and thought she should go to the hospital to be safe. She approached the front desk, thinking that she would register first, when it felt like the baby was already out. She asked for a wheelchair and a doctor and lay down on the floor. 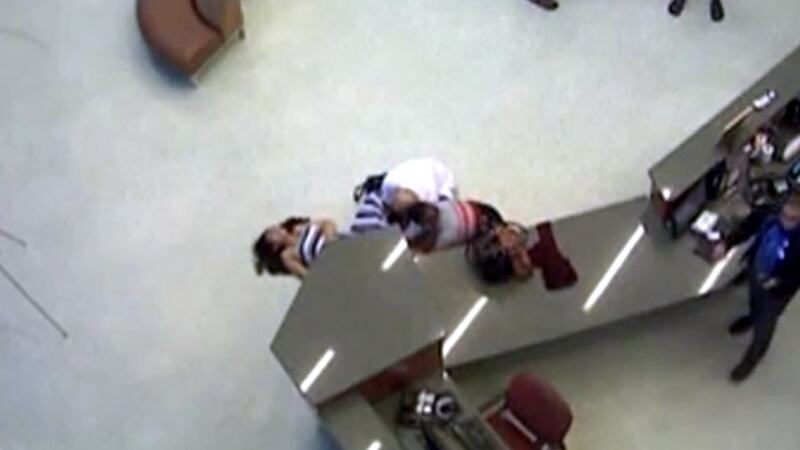 “She was saying her fear was the baby [would fall] on the [floor] of the lobby,” Lozano says. Privada gave one push and the baby’s head was out. The umbilical cord was wrapped around the baby’s neck so Lozano maneuvered the baby to free it and prevent her from being strangled. “I never encountered [something like this] in my life, delivering a baby [with] my own hands,” he says. While he has worked as a nurse for 10 years, Lozano works in surgery, not labor and delivery. After the little girl was delivered, he cleaned out her mouth and wiped off her eyes. For about three seconds, there was complete silence and Lozano felt panic. Was something wrong with the baby? Why wasn’t she crying? He handed the baby over to mom who immediately proclaimed her daughter beautiful. Privada named her Dayana Emperatriz and asked Lozano if he’d be the godfather. He agreed. Dayana weighs 6 pounds 8 ounces and mother and baby are doing so well they’ll probably head home Friday. A security camera captured the scene, which lasted less than five minutes. While it appears that everyone but Lozano ignored the laboring mother, the staff were doing what they were supposed to, calling for a wheelchair and doctors, said Lidia Amoretti, a spokeswoman for Jackson Health System. But Dayana came so quickly that help couldn’t get to Privada fast enough. If she were in the ER, the staff could have reached her faster, Amoretti added. And the hospital is having fun with their unexpected lobby delivery. "We can't guarantee that every Jackson patient will have such a speedy delivery, but we can guarantee the best care for whatever happens with your birth," Carlos Migoya, president and CEO of Jackson Health System, said in a news release.